70 million teachers and students use G Suite for education on a daily basis. 20 million Chromebooks are in use in classrooms around the world. Imagine that you have been asked to hire one of the following companies to help improve student achievement in your school district. Which one would you hire? Google dominated the responses. Over 50% of educators would hire Google to improve student achievement. Ease of use was the clear reason for this choice. Chromebooks play a significant factor for this choice. The combination of simple hardware and reliable web applications is perfect for the classroom. Chromebooks are the clear device of choice for the majority of schools in the United States. Over half of all K-12 devices deployed in the past two years are Chromebooks. The EdWeek report confirms this trend. Ease of use and cost are the two driving factors. While it is clear that Google is dominating the education market, we may not be at “peak Google” yet. 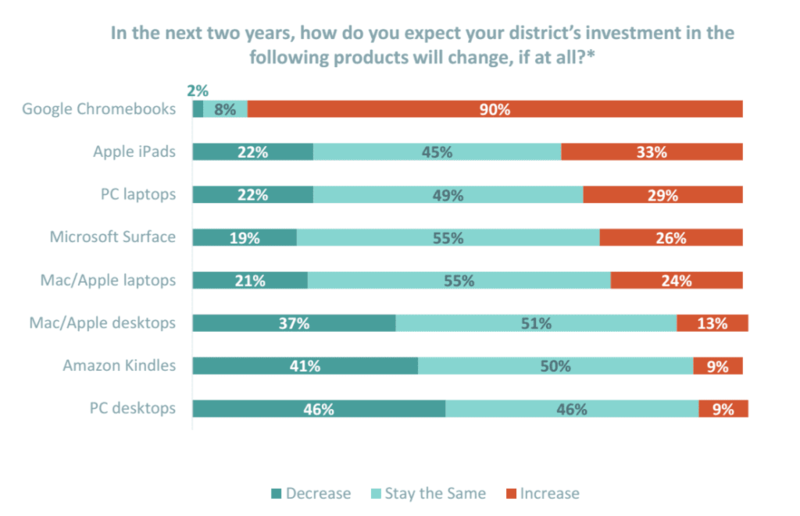 EdWeek reports that 90% of the school districts surveyed plan on INCREASING their Chromebook purchases over the next 2 years. These purchases come at the expense of Microsoft and Apple. Both companies registered a 20% reduction in planned device purchases in this survey. Google has struck a goldmine in education. Investing in education was a successful strategy for both Apple and Microsoft. But both companies are now playing catch-up with Google. It’s hard to imagine a single company capturing more than 50% of the education device market, yet Google has done so for the past two years. Is it possible that they could go even further? 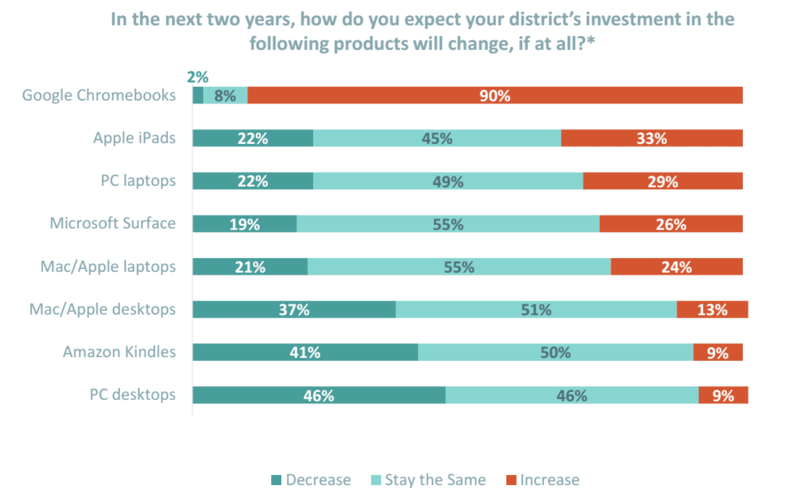 Will 2018 and 2019 see Google’s classroom market share top 60%? 75%? The future looks bright for Google in classrooms around the world. John Sowash is an experienced classroom teacher, former school administrator, author of The Chromebook Classroom. John inspires educators to use technology to connect with and challenge students. Schools around the world have invited John to come and share with them. You can connect with John via his blog (electriceducator.com) or Twitter (@jrsowash).